With a powerful 279-ft. (85 m) telescopic main boom and a full range of lattice jib attachments, this Liebherr AT can handle jobs at — and often above — its 500-ton (453 t) capacity. 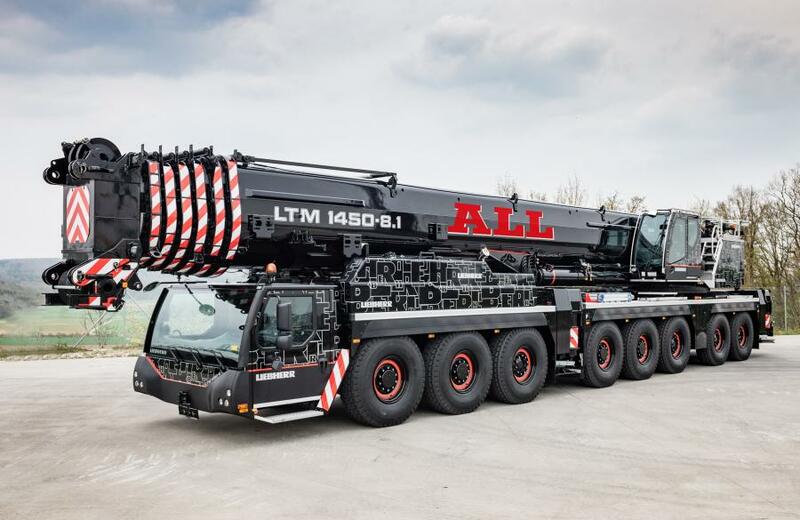 The ALL Family of Companies will take delivery of two 500 ton (453 t) Liebherr LTM 1450-8.1 all-terrain cranes. In keeping with ALL's strategy of working with manufacturers to obtain the newest and best machines, the company ordered these cranes before they had even made their U.S. debut at last spring's ConExpo-Con/AGG show in Las Vegas. With a powerful 279-ft. (85 m) telescopic main boom and a full range of lattice jib attachments, this Liebherr AT can handle jobs at — and often above — its 500-ton capacity. The LTM 1450-8.1 was manufactured to accommodate a variety of transport weight and machine axle configurations, making it one of the most road-friendly 8-axle ATs on the market, according to the manufacturer. The LTM 1450-8.1's VarioBallast system adds capacity when needed, but still allows the nimble AT to work in spaces where many other large cranes simply will not fit. There is great potential for the machine on wind farms, refineries, chemical plants, as well as in setting up tower cranes. The machine is ideal for a national crane rental company like ALL, where machines move from yard-to-yard and state-to-state based on market demand or a specific job site's needs. Finally, the LTM 1450-8.1 doesn't require a special trailer or a superlift. Liebherr previously has utilized a super-lift attachment for its large ATs, also known as a Y-guy or superlift system. The new LTM 1450-8.1 is designed to achieve strong capacities without the need for a superlift, which saves time during setup, reduces costly trailer loads, and allows for large jobs in confined spaces, according to the manufacturer. It all adds up an amazing mix of easy transportability, fast set up, and lifting power. “Customers are going to love it,” said Strader.